It dawned on me the other day that I haven't posted a book review in ages. I think I've written maybe 4 or 5 reviews over the past 5 years so this review will be my sole contribution for 2016. (Half joking). This makes some sense because, frankly, the majority of gardening books don’t appeal to me. I ignore topics and titles, for example, dealing with city or urban farming, “the 100 best plant combinations”, do-it-yourself landscape construction projects, “frugal” gardening, etc. I find them usually pedantic, parsimonious, simplistic and, worst of all, boring. I’m more drawn to stories about people who love gardens and/or particular plants to the point of obsession, grief, ecstasy, or lunacy. (Eric Hanson's Orchid Fever which I reviewed several years ago comes to mind.) 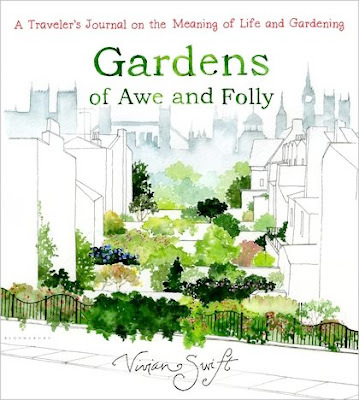 Could such emotions be found in Vivian Swift’s latest book Gardens of Awe and Folly: A Traveler’s Journal on the Meaning of Life and Gardening? ((2016). New York, N.Y.: Bloomsbury USA). Book cover of "Gardens of Awe and Folly" by Vivian Swift. I found this title intriguing. You see many gardening books along the lines of “the top 100 gardens to visit before you die” but a book about “gardens of awe and folly?” About seeing gardens that are frivolous, inside jokes, whimsical, unsuccessful and worse of all in this day and age, don't grow vegetables? Can one possibly find the “meaning of life” in such a silly space? I’m naturally drawn to incongruities, disconnects, aberrations and the occasional hyperbole inside and outside gardens so Swift’s new book seemed promising, as far as titles go. Beautifully rendered water colour paintings produced by the author herself capture how each garden holds a unique and special place in Swift’s heart and imagination to an extent that mere photographs cannot. Her travelogue covers the time spent with friends or by herself in very different locales and contexts: an overly contrived Japanese garden in Long Island, New York; a solitary visit to Edinburgh Baroque garden during the “gloaming” hour; the feeling of saudade experienced in a moonlit Brazilian garden. There is wonder, sadness and wry humour throughout her “travel notes” (her comparison of New Orleans to Cleveland is gently withering.) We come across people, places and gardens once lost, now reclaimed; their stories forgotten then remembered. I think gardeners (and especially garden-makers) know this instinctively: Every garden tells a story, regardless how small or large, simple or complex it seems at first glance. Sensitive garden visitors can pick up on this too by putting away our plant lists and, dare I say/write, asking owners and custodians questions. Gardens of Awe and Folly comprise of nine short stories about small gardens that seem unrelated in location, style, and plantings yet are connected to Swift since each has given her, in her words, a “wow” moment and an epiphany in its own way. I know exactly what she means by that. A “wow”, a revelation, a new story to tell others. I experienced these moments in a classical Chinese garden in Suzhou, a tropical garden in St. Lucia, under an ancient ginkgo tree at a local park with my young daughter. I’m sure you have felt the same spending time in your own garden or visiting another. And that story has been told ever since we’ve been on this planet, conceiving and wrestling gardens out of nothing. Helpful words to consider as we go into yet another growing season, wherever you are.